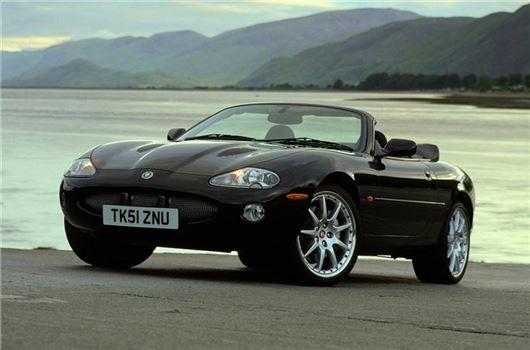 I am looking at a green 2002 Jaguar XK8 with 48,000 miles, re-imported from Japan. The dealer is seeking £9,500, providing a service and 12 months MoT. I am 67, drive sympathetically around 4,000 country lane miles a year. Your thoughts please and anything I should be concerned about? I have a 2007 Mercedes GL420CDI V8 diesel with 7G auto gearbox. It has now developed the following fault: As I decelerate at about 15 to 12 mph, it unexpectedly changes down into what must be 1st gear, but it feels as it someone has run into the back of me, its so fierce. If I then accelerate it performs normally, but reverts to the original fault as soon as I slow down. Any help would be greatly appreciated. The Mercedes dealer in Swindon is unable to help. Your advice on Superfuel is taken seriously. I have used Shell V-Power for many years and found the petrol demonstrably more efficient and performance enhancing. The Diesel V-Power is less obviously self-proven, but non-the-less I follow your advice. However, one aspect I take issue with is the pricing. By using the advertised diesel price as a means of selecting a price friendly fuel station, I find the 'add-on' for V-Power varies considerably - thereby undermining the initial price comparison. This often is not apparent until filling has started. The add-on seems to range from 9p to 21p. This seems sharp practice to me. The additives cannot vary. Is this something you could take up with Shell? Surely we should expect a consistent and clearly advertised add-on at all Shell Stations. Unfortunately this is in the hands of the franchisees of the fuel stations who can charge what they like. But, when they obviously exploit customers, they will lose them, and will be forced to reduce their greed. I’m now recommending not to pay more than £1.50 a litre for Super. I have just noted your response to slip roads. I was under the impression that IAM drivers should show courtesy towards other road users. I may be wrong, as it is a while since I did my basic test. Showing courtesy while you are on the main road is assisting drivers on slip roads seeking to join the main road by anticipating their needs in advance and moving over if you reasonably can. This especially applies to assisting the drivers of large trucks, and more so on dual carriageways with short slip roads such as sections of the A1. I drive a KIA Venga automatic, doing about 8,000 miles a year and using Shell V-Power petrol. At my annual service I am offered: A bacterial cleanse; Brake fluid change; Engine oil flush; and Fuel treatment. Which, if any, of these do you consider worth paying for. You can kill the bacteria in your ventilation trunking simply by opening the car windows, then running the heater at maximum heat for 15 minutes while you stand beside the car to stop anyone stealing it. You might need a brake fluid change because any moisture in it corrodes delicate internal ABS parts. If you are using V-Power you won't need a fuel system clean. If the oil is dark brown you might need an oil flush. Make sure the old oil is drained from the sump and not siphoned out. I have an AMG Mercedes 3.0 litre bi-turbo. I currently use Shell V Power every fourth fill. Should I only ever use 98 Octane fuel? And would I be correct in assuming that it is more or less cost-neutral. Cost differential is around 9%, but I am told that mpg is improved by 10%. True or false? Use Shell V-Power all the time. The engine is optimised for it. Why sacrifice 10% of its horsepower and torque and run the risk of fuel system problems when you have spent all that money on a high performance car? Just refuse to pay more than £1.50 a litre for it. I was interested in your recent comment concerning a quote for a service for a FIAT 500. I was recently quoted £280 to service a 2-year old FIAT Panda 1.2 Lounge by my local FIAT garage in Abergele, North Wales. I asked them to check the quote but they confirmed it was correct. I contacted FIAT who said they could charge what they liked as they were a franchise. I went elsewhere, had a full FIAT service, service record updated, all for £126. How can this be? As FIAT told you, they can charge what they like. But the £126 service may not have been as comprehensive as the £280 service would have been and if not fully itemised on the invoice might void any warranty claims on the car. I note that LV=, my insurer, is charging me nearly 10% of the value of the annual insurance cost for a protected NCD. May I have your opinion please on the value of these things? Depends on the terms of it. But basically, if you care involved in a claim, a 'Protected' No Claims Discount means you do not lose all of your NCD. For example, if your premium is £1,000, less 60% NCD you will be paying £400. Lose the NCD and you will be paying £1,000. But if your NCD is partially 'protected', you may only lose 10% NCD and end up paying £500 a year. I am now on my second 1.8 Verso CVT. I have been very happy with them and am definitely a convert to an auto box. Since the Verso is no more, I am now considering cars for next time: The Skoda Karoq, Peugeot 3008, and Toyota C-HR, all with petrol/hybrid engines. I am aware that you have doubts about the DSG box for the Skoda, so which of these is likely to be the most reliable and robust? There is no current 3008 petrol hybrid; only the unsuccessful previous model diesel hybrid 4, not recommended. But the current 3008 1.2 Puretech EAT6 torque converter auto is excellent. The Toyota C-HR hybrid steers, rides and handles beautifully, but is quite expensive. No hybrid Karoq as yet. The Toyota is the only one with a 5-year warranty. My 2010 Subaru Forester ‘boxer’ diesel has an intermittent flashing DPF light; occasional loss of power, and, as recently discovered, seems to make its own engine oil as it was found to have 2 litres extra. No one seems to know what the problem is. The reason for this is that you are switching off the engine while the DPF is actively regenerating using post-injected diesel to burn off the soot inside the DPF. If you switch off mid active regen, that post-injected diesel sinks into the sump, contaminating the sump oil and raising its level. The way to avoid this is to drive greater distances and also, whenever you stop, leave the engine running and open the door. If you then sense a lot of heat under the car, keep the engine running, and preferably keep driving for another 10 minutes or so for the regen cycle to complete. Inconvenient? Afraid so. In March 2014 I purchased a 1-year old Freelander 2 HSE LUX. On a test drive, the salesman put supermarket diesel in it and it seemed to drive OK and I continued using supermarket diesel. Then, weeks later, I noted a severe ‘flat spot’ when pulling away from T-junctions etc. when on an upward slope. Reversing up steep driveways was almost impossible. I took the car back to the Land Rover dealer and was advised they knew about this flat spot on that model but there was ‘No fix’ for it. The new Discovery Sport would not have the same problem. On reading your recommendation not to use supermarket fuel I changed to BP Ultimate Diesel and the flat spot vanished. I have now done circa 80,000 miles in my Freelander and think it is by far the best car of the 35 plus vehicles I have ever owned, so thank you for 1st class advice that has led to much safer motoring for me. And many thanks for supporting my case. It doesn't surprise me at all. If only everyone else would learn the same lesson. Just don’t pay more than £1.50 a litre for it. Though w have received more than a few complaints about the VW Golf VI, we don't appear to have any other reports of a/c compressor failure: /carbycar/volkswagen/golf-vi-2009/?section=good / I can't figure out why the compressors failed after replacing the EGRs unless the dismantling involved removing the aux belt and it was put back too tight. My Lexus IS200 LE auto is now 14 years old. I have owned it for10 years. It is brilliant, high spec and luxurious. However, as I am due to retire in the next 2-3 years I think I should reluctantly replace it now. 3 years finance should give me about £12,000 to spend. I do low mileage but keep my cars for a very long time. I considered the IS250, but am a bit put off by high VED. A CT200 hybrid would probably suit, but can I realistically expect the batteries to last 10-15 years. I might add, I do a low mileage of 6,000-7,000 a year. I would appreciate your thoughts. You might be all right with a hybrid, but you lose the benefit of them with a small mileage because it does not re-charge the hybrid battery pack sufficiently. Maybe better to go for something like a Honda Civic 1.8iVTEC manual or 5-speed torque converter auto. Very reliable. Very economical. Scour Autotrader for others advertised, but difficult because just about every Westfield had a different spec (there are 11 on the site): https://www.autotrader.co.uk/car-search?advertising-location=at_cars&search-target=usedcars&is-quick-search=true&radius=&make=WESTFIELD&model=&price-search-type=total-price&price-from=&price-to=&postcode=kt138qh An alternative to advertising on Autotrader might be Pistonheads. Your problem is the distance most people will have to travel to see the car. If you have a friend in the Midlands it might be an idea to locate the car there for a viewing weekend. A month ago, both gas struts of my Honda Civic Tourer failed at the same time, without any warning, letting the tailgate down like a guillotine. The consequences do not bear thinking about. As it was, only an expensive fishing rod was smashed. It could have been a child. Have you heard of this happening before to Hondas, or indeed any other model or make? Never. This is a first. Get it to the dealer who should be very concerned. We have a Jaguar XF, registered new in September 2015. It's the steel bodied original version with the 2.2 litre 200PS Diesel engine. It was a fully loaded run-out model. It's beautiful to drive, has done 12,000 miles. I only use Shell V-Power, as you recommend and, over the 12,000 miles, it's averaged 46.5mpg: excellent for a car that weighs 2,050kg. The dealer tells me that they have had few problems with this model and engine and that it is reliable. Jaguar is offering an extended 12-month warranty that carries on from the year 3 for £654, and if I take it I can then buy a year 4 and year 5 warranty for £849 per annum, if I wish to when that time comes around. The £654 warranty can also include roadside assistance if I pay £739. (I don't have separate roadside breakdown cover.) For peace of mind and to ensure continuity for the first 5 years of ownership do you consider this to be a fair price to pay, please? Yes. This is the record of the Jaguar XF: /carbycar/jaguar/xf-2008/?section=good / KIA gives new car buyers a 7 year / 100,000 mile warranty, which brings into question why other manufacturers see fit to charge for anything more than a 3 year warranty. Japanese reimports - having been involved in the manufacture of UK vehicles for export to Japan you may find that they have been inspected to higher than UK market standards before leaving the factory. They are likely to be less rusty due to Japanese road conditions. They will need speedo recalibration to mph, and may be worth less if resold due to unclear history, but personally I would have no qualms buying one. I use Shell V Power petrol but it is getting expensive and you promote not to pay more than £1.50p a litre. So, would you recommend Tesco’s Momentum 99 or Sainsbury’s Super Unleaded as these are my two local alternative petrol stations ? Note that, if I recall correctly, most Supermarkets don't put much, if any of the additives in the fuels that the top branded filling stations do, especially in their super fuels, which is why they are so much cheaper (even more so than the price difference between their regular fuels). All you are getting is a higher octane fuel, fine for performance, no difference in engine cleaning ability. That's what you (mostly) pay the extra for at the branded filling stations. That being said, many of them do overcharge if they don't have much competition in the area. I personally wouldn't pay more than 10% more for branded superfuels than regular unleaded from a supermaket, i.e. UL 95Ron @£1.30, so the max price I'd pay for SUL 97-99Ron is £1.43 on a regular basis. As HJ says, it can make a vast more of a difference depending on the car its used in and the type of driving you do and maintenance regime followed. My car isn't a performance model, is a standard injection non-turbo charged petrol engined car, does 95% of its work on fast flowing roads (even though its overall annual mileage is low) at 60mph+ and does almost no short journeys (under 2-5 miles from cold). It is also very well maintained and I bought it effectively brand new, so I know its entire history. A second hand car could've done lots of urban short journeys from cold or been poorly maintained, so the extra detergents and other additives in the branded fuels (especially the super fuels) will be of far more benefit, even for newer cars (mine is 12yo), and especially diesels. For performance cars, especially turbocharged petrol cars, many are specifically designed to maximise performance from higher octane fuels, so will benefit far more than standard ones like mine. I got about 2-3mpg more than I did before, not worth it as its cleaning effect wasn't required, and the cost of one tankful was more than the cost of a reputablemake's 4-dose injector cleaner that can be used at any time and whose effects will, IMHO, last a lot longer. According to Tesco's own website, "Momentum 99 also contains a special blend of additives to help keep the fuel system clean and working at its best."